YOUR CARD IS GORGEOUS.GOOD LUCK. Wow you have been busy, your blog is looking good, I am gonna follow. Great card Claire love it.well done on your blog looking great. Fab card Claire and the buttons are great. Thanks for joining the TS challenge. 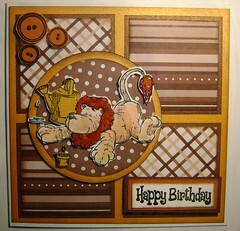 This is so cute - love the lion and great colouring too..